The carnivals are over and Lent is underway – a 40 day fasting period of no meat, poultry or dairy products. The bakeries accommodate those who fast by adding dairy-free, egg-free and meat-free pastries and cookies to their already vast array of goodies. Generally, fasting is followed more strictly in the villages of Cyprus than in the towns, but most restaurants and takeaways also add fasting dishes to their menus during this period. As Easter draws near, an air of festivity envelops the towns and villages. During Holy Week (the week preceding Easter Sunday) there is a flurry of church-going, shopping for new clothes and baking. The smell of the traditional Cypriot flaounes cooking, combined with the heady scent of orange blossoms in the air and the sound of singing which emanates from the churches, creates an atmosphere of expectation - a feeling that something good is just around the corner. Easter is the most important religious holiday in the Greek Orthodox Church. The date of Greek Orthodox Easter is based on a modified Julian calendar. In 2010 Greek Orthodox Easter will coincide with Easter in the Western Churches which use a different calendar, the Gregorian. The date this year is April 4th. Thursday of Holy Week is when the wonderful aromas begin to waft out onto the streets as this is traditionally the day when housewives start preparing theflaounes (small loaves made of flour, eggs, cheese, mint and sometimes raisins). These are shaped into triangles, sprinkled with sesame seeds then baked in the oven. Tiropites (small cheese pies in puff pastry), paskies (small meat pies) and koulouria (biscuits made of milk, flour, spices and sugar) are also prepared. Eggs are hard boiled and dyed red in preparation for games on Sunday. Everywhere is a hive of activity. On the Friday morning before Easter (Good Friday or “Great Friday” as it is called in Greek) families, carrying flowers, gather in the churches. The flowers are collected and used by young girls to decorate the Epitafios (Holy Sepulchre) during the service. The Epitafios is a four-post litter with a canopy in which the icon of Christ is placed. Early Friday evening a solemn service is held in all churches where the decorated Epitafios is carried into the streets, for a short procession, then returned to the church for a continuation of the service. 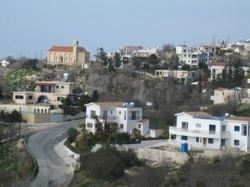 On Easter Saturday two services are held in church – one in the early morning and another at 11 p.m.
Before the 11 p.m. service, which is called “The Ceremony of the Resurrection,” church bells peal out in the villages and towns of Cyprus calling everyone to come and celebrate the resurrection of Christ. Huge bonfires are lit in the churchyards and slowly people begin to gather there. Every person carries a large unlit lampada (candle) and there is a general feeling of excitement in the air. The church services start at 11 p.m. A few minutes before midnight the lights in the church are extinguished and the choir sings the story of the three women who arrived at Christ’s tomb only to find it empty. The lights are switched on again and the priest calls the congregation to “take from his candle the light which never dies.” The flame is passed from person to person until everyone is holding a lit candle. The ceremony then continues outside the church for approximately 30 minutes, after which the priest returns inside again to begin the special Sunday liturgy for another two and a half to three hours. At this point, a majority of the congregants leave to celebrate with family and friends by watching the firework displays which are held outside most churches, and to share a meal of the traditional Cypriot trachana (a creamy, savoury soup of wheat and yogurt) or magiritsa (a creamy, lemony soup). The eggs which were hardboiled and dyed on Thursday are now used in a game where they are tapped against each other and whoever is left with an uncracked egg wins. The breaking of the eggs is symbolic of Christ breaking free from the tomb. Easter Sunday is when the celebrations really begin. Feasts of ovelias (whole roast spiced lamb, cooked on an open charcoal fire) or souvla (large pieces of lamb or pork also cooked on an open charcoal fire), salads, vegetables, breads, cakes, biscuits, sweets, flaounes and wine are prepared. The smell of outdoor roasting permeates the island. Lamb is the traditional Easter meal as the early Christians adopted this symbol from the Jews who sacrificed lambs for their Passover celebrations. From Sunday lunchtime until Tuesday night, in village squares and churchyards, traditional food, games and live traditional Cypriot music are to be found. Everyone, Cypriot and non-Cypriot, is welcomed and usually greeted with an enthusiastic, Kopiaste! Christos Anesti! Or Chronia Polla!